Mary was born in 1943 and raised in West Vancouver, daughter of David (writer and broadcaster) and Babs Brock. She attended UBC in the 1960s and graduated with a BA in fine arts. What a time to be at university, especially if one was studying the arts and humanities. It was a time to explore, debate ideas, and learn from others. First year university at only 17 years old was all a bit overwhelming. Mary, her twin, Phoebe, and a handful of friends soon left the comforts of Brock Hall (named after her grandparents, Dean Brock and Mildred) once they discovered the café on the other side of the campus, under the old auditorium. This is where Mary’s education at UBC really happened. They were formative years, when she met many creative people of all ages and all cultures, and shared in the ideals and dreams of what we all could become. of the Britannia Heritage Shipyard. Mary retired from the City in the late 1990s to become a teacher at Langara College for five years. With retirement she found time to continually develop her artist and writing skills. 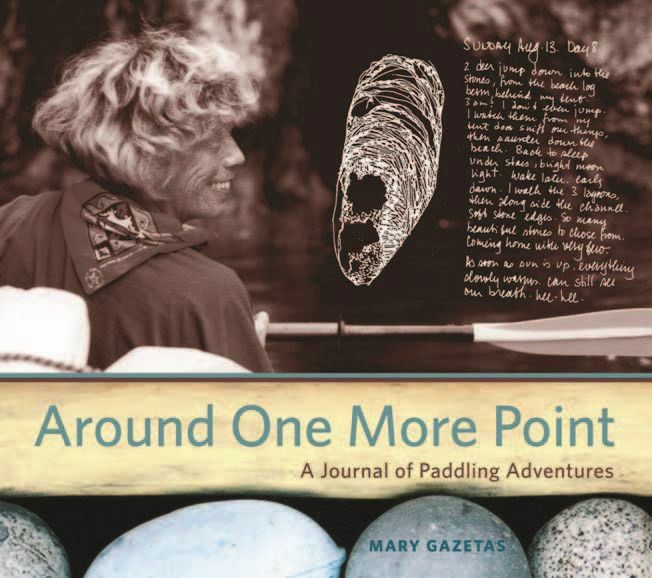 By the mid 2000s Mary had published a number of articles and the book Around One More Point, a collection of rich west coast stories, photographs, and sketches from 25 years of paddling with her family and friends. Approximately 10 years ago Mary volunteered with a number of her Richmond city and tennis friends to support the food security movement. They began with a few ladders and boxes. Fruit was gleaned from family properties and farms to support the Richmond Food Bank. Soon they started to grow vegetables on city-owned land, and then Mary led the development of the community based sharing farm up at Terra Nova – a farm that feeds the hungry today. Mary’s sense of social responsibility came to light and shone with the food movement. She won many awards. During Mary’s last few years she became a champion in caring for her husband, who lives with Alzheimer’s. At the time of Mary’s death this April she was compiling a special book on her approach through art, play and music for the Alzheimer’s caregiver and family. Mary was a regular contributor to the Alzheimer’s Reading Room online. Her fans reached out to her from all over North America. Whatever Mary pursued she became an inspirational and innovative leader. This was seeded back in the days of hanging out at the café. Wherever she lived, whatever she did, she influenced and inspired all those who were fortunate to work or volunteer with her. Her legacies, especially in Richmond, are many. Mary died unexpectedly on April 17, 2012, from complications associated with a staph infection. She is survived by her husband, Aristides Gazetas; her children, Michael (Michelle), Sophie (Tao, and grandchildren Sarah and Caitlin), and Calliope; her twin sister, Phoebe (Bob), brothers, John (Ruth) and Tim (Dorothy) who also all attended and/or graduated from UBC, along with her many cousins, nieces and extended family. I was a classmate of Mary’s in “Ris”‘s Theatre Design class, our last year at UBC. My years continued in Montreal and Toronto, so I was unaware of her extensive Rich,one comminuted work. Please pass on belated condolences, to Mary’s family. She was one on a million and your notes above capture my memory of her in many ways.